Who couldn't use a new pair of top-notch all-weather motorcycle boots? 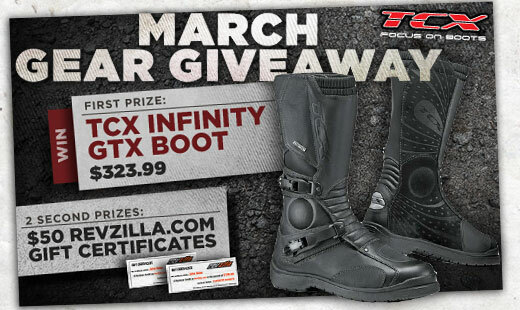 And who wouldn't like to get them for free, eh?Click over to RevZilla's March contest page, spend about 30 seconds creating a Rider Profile, than sit back and wait for the monthly winner to be drawn. The First Prize winner this month will receive a pair of TCX Infinity GTX boots, long a favorite of serious riders (GTX = Goretex after all), valued at $324. Two Second Prize winners will receive $50 Revzilla gift certificates.